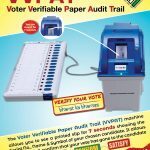 Voter verifiable paper audit trail (VVPAT) or verifiable paper record (VPR) is a method of providing feedback to voters using a ballotless voting system. 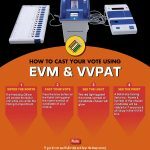 A VVPAT is intended as an independent verification system for voting machines designed to allow voters to verify that their vote was cast correctly, to detect possible election fraud or malfunction, and to provide a means to audit the stored electronic results. 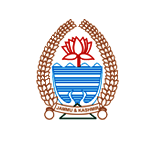 It contains the name of the candidate (for whom vote has been cast) and symbol of the party/individual candidate. 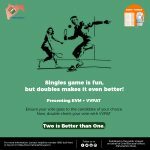 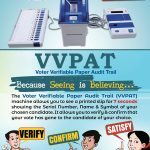 Voter Verifiable Paper Audit Trail (VVPAT) machines are used during election process to verify that the vote polled by a voter goes to the correct candidate. 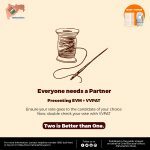 VVPATs are a second line of verification and are particularly useful in the time when allegations around Electronic Voting Machines’ tampering crop up.VVPAT system gives instant feedback to the voter showing that the vote polled has in fact been allotted against the candidate chosen. 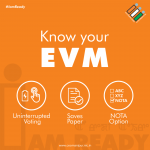 Working procedure of VVPATs After a voter presses the button on the EVM against the chosen candidate, the VVPAT prints a slip containing name of the candidate and the election symbol and drops it automatically into a sealed box. 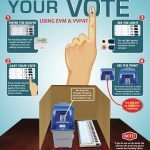 The machines give the chance for the voter to verify their vote. 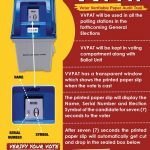 The machine is placed in a glass case in a way that only the voter can see it. 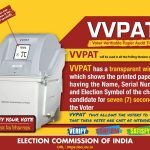 The slip is displayed to the voter for seven seconds after which the VVPAT machine cuts it and drops in into the storage box with a beep. 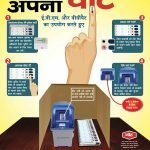 The machines can be accessed, though, by the polling officials and not by the voter.